Japan is bracing up for a stormy weekend as Typhoon Trami is scheduled to hit Ryukyu Islands including Okinawa on Sunday. The National Aeronautical and Space Administration’s (NASA) Earth Observatory, in a post, showed the storm moving through the Western Pacific Ocean, east of Taiwan, on September 25. NASA and the National Oceanic and Atmospheric Administration’s (NOAA) Suomi National Polar-orbiting Partnership (NPP) satellite also captured one such photograph in the infrared spectrum which shows the temperatures within the storm system. 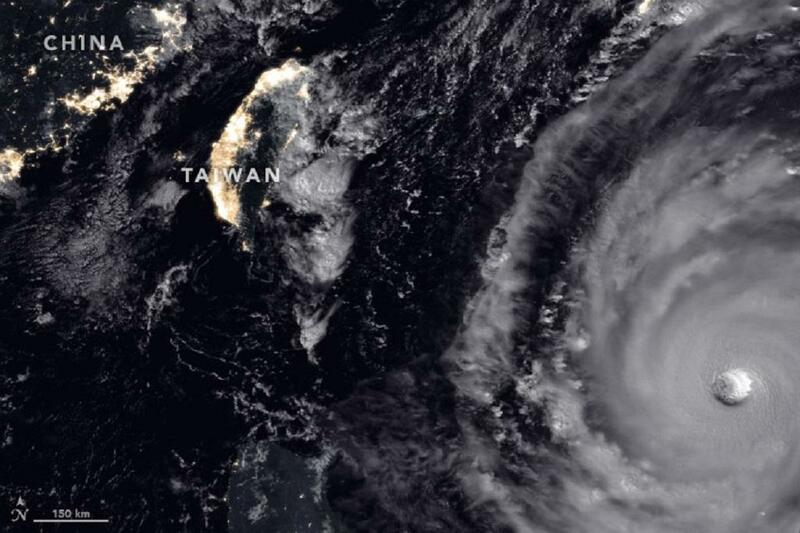 The satellite measured the cloud top temperatures at -83.5 degree Celsius which indicates that the typhoon carries copious amount of rainfall with it. At the time the typhoon had wind speeds as high as 260 km/hr which is equivalent to a category 5 hurricane (wind-speed greater than 252 Km/hr). That’s why it had been named a super typhoon. In fact, European astronaut Alexander Gerst looked down from space and said the storm system looked “as if somebody pulled the planet’s gigantic plug”. He tweeted this along with a photograph of Trami’s eye. However, the storm is weakening as it passes over the ocean and will make landfall with wind speeds of around 180-200 km/hr, which will make it equivalent to a category 3 hurricane (wind-speed between 178-208 Km/hr). Japan is already under a spell of rain as moisture has been pushed by the incoming storm. The rains will intensify as the typhoon moves closer and could cause landslides and flash floods in the country. Trami is the second super typhoon to form in the Western Pacific ocean in less than two weeks. Last super typhoon Mangkhut had left a trail of destruction in the Philippines killing more than 100 people. It had also affected China and was Hong Kong’s strongest storm on record. Five super typhoons have hit the Western Pacific this year, as reported by CNN.